On the iPad 2, e-books are organized in your iBooks library. E-book in the iBooks library are normally organized so that the most recently downloaded title is displayed in the top left corner of the first bookshelf. However, if you prefer, you can organize your e-books in collections (logical groups). You can also change the library view. Normally, e-books are displayed on shelves in the iBooks library, but you can change the view as needed. Start iBooks and tap the List button. Your books appear in a list. To display the list alphabetically by title or author, tap the appropriate button on the bottom of the screen. To display the list by category, tap the Categories button on the bottom of the page. Your titles are displayed by category titles such as Fiction, Mysteries & Thrillers, or Literary. To return to Bookshelf view at any time, tap the Bookshelf view button. E-books are displayed once again on bookshelves, with the most recently downloaded book first. Use the Edit button in List view to display Delete buttons for all books in the list. Tap a book’s Delete button (which looks like a minus sign) to delete the book, and then tap the Done button to exit the Edit function. iBooks lets you create collections of books to help you organize them by your own logic, such as Fiction, Business, and Cooking. You can only place a book in one collection, however. 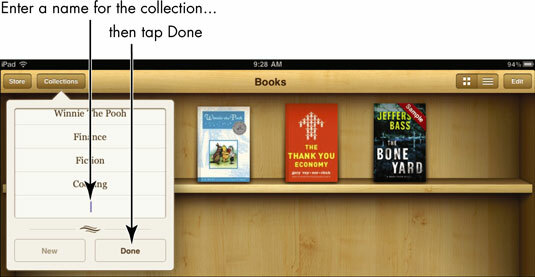 To create a collection from the Library bookshelf, tap Collections. Tap New, then type a name for the collection and tap Done. The dialog box closes and the collection is added to the Library. To add a book to a collection from the Library, tap Edit. Tap a book and then tap the Move button that appears in the top left corner of the screen. Tap a Collection to move the book to. The book is moved to the collection you selected. With a collection displayed, you can delete a book from the collection by tapping Edit, tapping the book, and then tapping Delete. To delete the collection and return books to the Library as individual titles, tap Edit, tap the minus sign to the left of any collection, and then tap Delete.